A lot of people have asked me what comes next after our Irish record. It tends to be a strange time after you complete a goal. Any achievement whether it be 1km or 160km leaves you first of all with a sense of pride, while soon after you realise there is more to come. What can I push myself to do next, how will I test myself or what is my next goal, would be a few questions we might ask ourselves at such a time. As the body recovers I find myself looking at races or events in the season ahead. I have a great base now after the recent events and might as well try and keep this going. In saying that rest and recovery, light training and plenty movement is very important before jumping into anything too quickly. At the moment I am signed up to the Wicklow Way Race 127km, the SCOTT Snowdonia trail marathon ,Kerry Way Ultra Lite and the Mourne Skyline Marathon. The first in June, second in July, third in September and the fourth in October. If I can get to the start lines in one piece I hope to do myself justice in each event. The most exciting part of these races will be the fact that I have never taken part in any of them, sure up until last August I had never gone for more than 9 hours at any event and had never completed the marathon distance, or even tried. In saying this to be in a position to have the confidence to take on these events feels great. The body suffered during the 26 peaks event, I recovered well but I have a touch of achilles pain and I am minding that at the moment. I played football on Tuesday thinking everything was ok. My achilles was actually fine but my hamstrings got the shock of their lives. Only 3-4 weeks without sprinting and my hamstrings had probably shortened with all the distance covered. The result in sprinting short distances was extremely sore hamstrings and this in turn has left me with backpain the last two days. Nothing some foam rolling, dynamic stretching and a bit of yoga tomorrow won’t cure. My running life took a funny turn today as myself and Shaun were asked to go on national TV, (TV3,Ireland AM), to speak about our adventures on the 26 peaks. Of course I am scared of TV but I also felt so lucky to be in the position to go on TV and talk about something I enjoy so much. The mountains along with the lakes are my favourite place in the world and to have scaled every high peak in Ireland is a great feeling. I encourage everyone to try some hiking in the mountains this summer, you won’t regret it. Last week was another week away with work on a training course so I only managed two runs during the week and a short spin on bike on saturday along with a soccer tournament during the day. I continue to do a few hours yoga every week also, and I have to say I am feeling the benifits. It was probably the perfect rest week, in terms of physical rest anyhow, and I have launched myself back into hard training this week. The only problem is I don’t really have a goal race. I am planning a big holiday in July to Canada and that means my races in June will have to take a back seat. The cost and time involved in races in Kerry and Donegal would leave me with very little cash or time for work leading up to my trip. This all means the chance to try a few local races in the coming weeks and I plan to try a few 10 k races as well as a half marathon in June all going well. Anyhow that is the news, however boring it may be. I really believe in the motivating factor of an event or goal and if I slacken off while the going is good it will only leave me with a lot of work to do when I return from Canada. The advice I have received from experienced adventure racers is to always have a goal race, and maintain focus on that race in training. I went for a 45km spin on bike today, mainly to try out my new aerobars, the cheap ones, and I have to say they were excellent, especially when battling into the wind. I threw in a 6.5km trail run in the middle to make the most of my day off work. After a 17.5km progression run yesterday it has been a good start to the week. A progression run for anyone wondering is a run where you gradually increase the pace and finish as strong as you can. A good indicator for race day really. Right time to go here and stop my wandering post, the cats are looking for some food ! As I take a few days off training, I think this kind of article can motivate me to get going again . Now it’s time to relax and enjoy my little break in London. 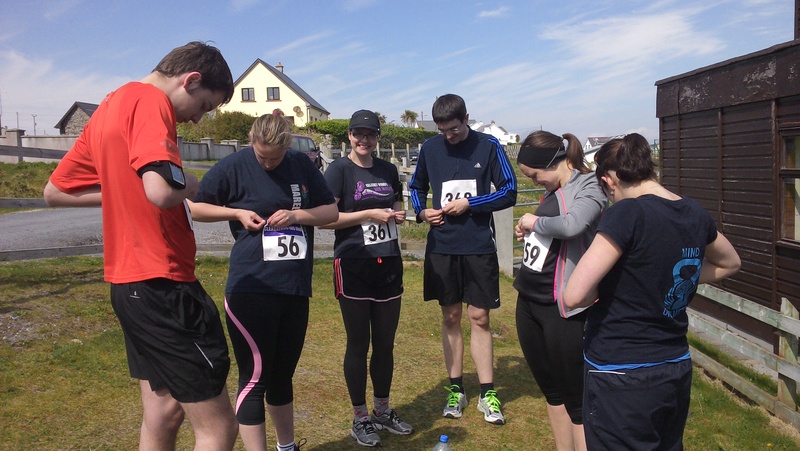 Inisheer has become an Easter tradition with a relatively small field competing in a very tough 10km road race. In my experience it is one of the most hilly and challenging 10k races around. As they say on their site it is undulating ! It was a fabulous day Saturday with hot sunshine and I wasn’t particularily looking forward to the race in the morning as I had a few later nights and early mornings with work over the last week. The race kicked off at 1.30pm and I took an early lead. Probably heading out too fast but I wanted to try and maintain a good pace. Treating it as a tough training session. My splits and times can be seen below. After a few little hills on the first 3km the real racing started. One guy caught me around 4km and we were head to head for the next few kilometres until he stretched a few second lead on me. I was catching him on the downhill but his climbing was excellent and in the end this paid off. 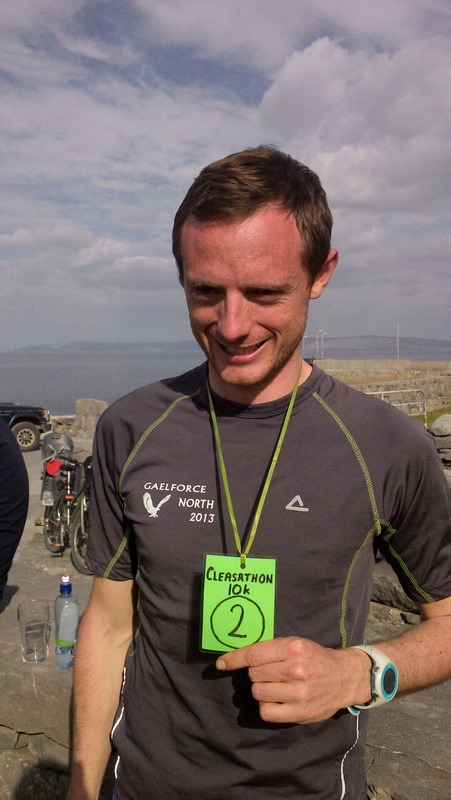 The course was great with grass tracks, steep hills with views of castles, the sea on all sides, and plenty twisty downhills to test running skills to the max. All in all I finished in 36.59 in second place and was happy enough considering not feeling my best during race and the hills were a challenge. Happy chappy after the race! Serious medal ! Everyone finshed, happy to reach the food and a well deserved pint in the sun.A great race, and a super spread by the local community after. Bad news to add is the I seem to have pulled a quad muscle while playing soccer on Sunday. This may not be a great preparation week before Wicklow Adventure Race. Resting up now. So I had a rest since Thursday with a trip to London to visit friends and catch an Arsenal match! Back to gym today and did a block session. 20 minutes run with interval sprints. Time to get this training rolling as pre season looms! Last week turned into a mostly rest week with some studying of form of competitors from the race on Saturday to a few light gym sessions. I also returned to playing some football for the winter months. I have missed most of my teams season through injury and then race training so its nice to get back to playing a bit. My plan for the winter is to do some long low intensity runs with some gym training with core and intervals on the bike. I will also add in a few sessions on threadmill for bad weather with some high tempo running. This mixed with football training will keep me tipping along nicely. My only problem will be minding my dodgy ankles. This may need some extra balance, plyometric and wobble board work. To get things started again I have posted a good link for those triathletes out there.